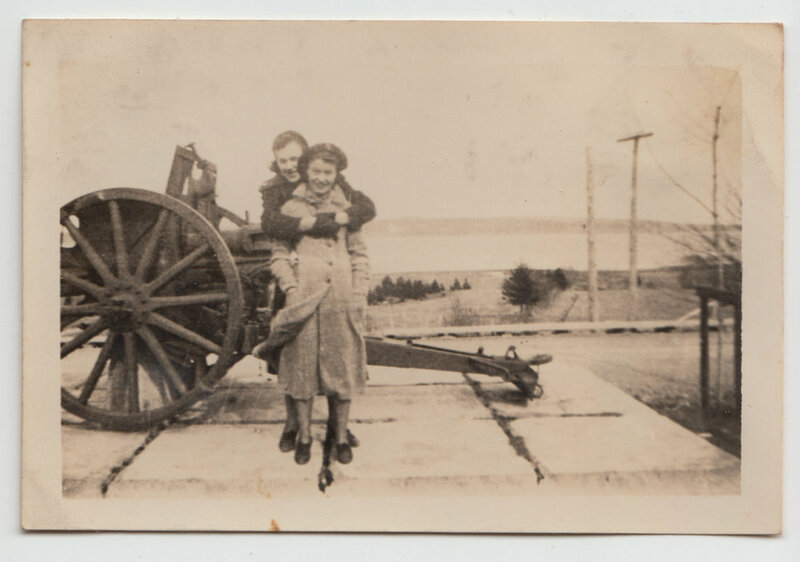 On June 11, 2016, everyone is invited to visit between 10:00am and 4:00pm to share memories and memorabilia from the First World War relating to New Brunswick’s significant contribution. A number of other Museums will be on hand for the day with items from their collections for a great show and tell experience. Besides the Albert County Museum, Resurgo Place (Moncton Museum), Musee Acadien and the New Brunswick Military History Museum will all bring items to help share New Brunswick's stories and answer questions. The event is not just limited to collections housed in museums either. The public is also invited to bring items and memorabilia from their private collections to show publicly for the day. If you wish to bring along some items, please contact the Albert County Museum in advance at 734-2003 to reserve your space. The Museum will offer admission with a free-will donation towards the Museum’s Victory Cannon Campaign for the restoration of the two First World War Trophy Cannons that sit prominently next to the highway in front of the museum buildings. 12th BATTALION C.E.F. (Canadian Expeditionary Force), 8th BATTERY C.F.A. (Canadian Field Artillery), 1st BRIGHTON FIELD. COMPANY CANADIAN ENGINEERS, 26th N. B. BATTALION ("FIGHTING 26th"), 55th N.B. and P.E.I. BATTALION, 2nd DIVISIONAL AMMUNITION COLUMN, R.C.A.S. CORPS, 23rd BATTERY C.F.A., 24th BATTERY C.F.A., 28th BATTERY C.F.A., 64th N.B. and N.S. BATTALION, 104th N.B. BATTALION, 115th N.B. BATTALION, 132nd BATTALION, 140th BATTALION, 145th BATTALION, 165th FRENCH ACADIAN BATTALION, 236th MacLEAN HIGHLANDERS, 58th BATTERY C.F.A., 65th BATTERY C.F.A., 89th BATTERY C.F.A., 4th SIEGE BATTERY CANADIAN ARTILLERY, 6th SIEGE BATTERY CANADIAN ARTILLERY, No. 16 CANADIAN FIELD AMBULANCE, 257 RAILWAY CONSTRUCTION BATTALION, and other various drafts of infantry and engineers. On June 11, 2016 from 10am until 4pm we are hosting a New Brunswick Battalions of the Great War Event, where we are bringing together collectors, museums and individuals to share Memories and Memorabilia of the First World War. If you have one piece or a whole collection of items from any of the New Brunswick Battalions and Batteries we encourage you to come out. Please share this with anyone who might be interested. 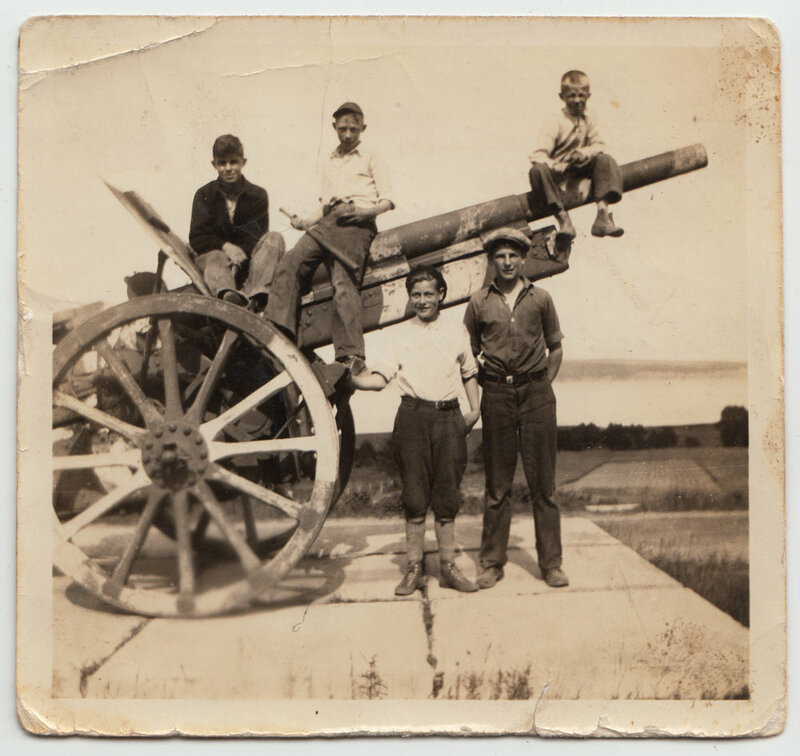 Admission is a free-will donation to the Victory Cannon Campaign, which is restoring two WW1 German cannons that sit in the square in Hopewell Cape, NB. This event will be held in the Community Hall at the Albert County Museum, in Hopewell Cape, NB. The Tenth Top 10 Historical Event in Albert County was Founding of Fundy National Park in 1948. The following is an excerpt from “The Salt and the Fir: Report on the History of the Fundy Park Area” by Gilbert Allardyce. The Museum has a typed copy of the unpublished 160 page report in the museum collection. It should be noted that the founding of the park was the primary impetus behind the creation of the Albert County Museum, to help keep alive the memory of the communities lost in the creation of the park. CLICK TO READ MORE! The fourth event in the Top Ten Historical Events in Albert County History in review. Prior to the establishment of the Province of New Brunswick in 1784, Albert County was part of Cumberland County, Nova Scotia. During the late 1700's, following the arrival of tens of thousands of Loyalist refugees from the American Revolutionary War pressure began to build to separate New Brunswick and Nova Scotia into two Provinces. Originally following the split of the two provinces in 1784, Albert County was part of Westmorland County. However, with the economic and population growth of the county in the early 1800's pressure began to build to split the county into two separate counties. In 1845, the lands west of the Petitcodiac River in Westmorland County were established as a separate county and named Albert in honour of the Prince Consort. The main reason for creating a separate county was because the seat of Government of Westmorland County was located across the Petitcodiac River in Dorchester. Dorchester is not accessible by water in the winter and a journey by land could take several days. This made it difficult for Government and Legal proceedings to be carried out in a timely manner. Each county in New Brunswick is divided into parishes. The number of parishes in Albert County has changed over the years as the population has expanded. The original parishes (known as townships) were Hopewell and Hillsborough both established in 1765. Salisbury township was created in 1787, it included the lands west of the Hopewell and Hillsborough townships including parts of what are now Elgin and Alma Parishes. Note the Village of Salisbury is part of Westmorland County and not Albert County. When Albert County was created in 1845 the Village of Salisbury remained part of Westmorland County. Elgin Parish was set off from Salisbury Parish in 1847. Coverdale Parish was created out of the lands west of Hillsborough in 1828 and was extended west to the County line in 1845. The Parish of Harvey was set off from Hopewell in 1838, and included Alma Parish. Alma Parish was created in 1855 when Harvey Parish was divided. From 1855 until today Albert County has been divided into sixparishes they are: Alma, Harvey, Hopewell, Hillsborough, Coverdale, and Elgin. Hopewell Cape was chosen as the location for the Shiretown (seat of government) of the new county. In 1845 construction began on three new buildings in the new Shiretown. They were the Municipal building, where the business of the new county such as land registration would take place, the Court House where trials would be held, and the County Gaol (Jail) where prisoners awaiting trial were to be held. The original court house built in 1845, burned down in a forest fire in 1903. It was replaced in 1904 by a beautiful two story building. The new court house contained judges chambers, a second story balcony which allowed more people to attend court proceedings, and modern amenities including plumbing. The most striking feature of the new court house was the beautiful tin ceiling which was hand made by local tin smiths. The one story Gaol built next to the court house was constructed out of local stone and contained three jail cells. Following the forest fire of 1903 a second story was added to this building when the court house was rebuilt.This second story was where the jailor and his family lived. Although the stone walls of the jail cells and the heavy jail cell doors look imposing, in fact most of the inmates of the jail were not incarcerated for serious crimes. Most were let out of their cells each day to work off their debt to society. The most famous trial ever held at the court house was the trial of Tom Collins for the murder of Mary Ann McAuley in 1906. After three trials Tom was found guilty of the crime of murder and sentenced to hang. He was hanged outside the jail and then buried on the lawn behind the Jail. By the 1960's the municipal building, court house, and jail ceased being used to conduct government business and the buildings were turned over to the Albert County Historical Society. The Historical Society now operates the buildings as a museum. Visitors to Albert County can visit the museum in the summer months and learn more about the history of Albert County. The minutes from the first few meetings of the new County Council for Albert County, held in 1845, still survive to this day. A number of issues were discussed at these meetings. The minutes reflect the issues faced by the county councilors in those days. They included: establishing community pastures, selling "illegal" liquor at a tavern, contracts for mail conveyance by horseback (transporting mail by pony express), appointment of "Overseers of the Poor", funding allocation for each parish for activities such as schools, and appointment of parish tax collectors. One of the most interesting notes from those County Council minutes, indicates that the "Overseers of the Poor" had discretion as to the quantity of (seed) potatoes to be given to the poor. In addition, they were not to give an amount exceeding ten bushels of potatoes to any one individual or family. It appears that potatoes were more important in those days than money. By 1871, the population of Albert County had grown to over ten thousand. As industries such as farming, forestry, and mining expanded, so did the population. This Saturday, June 13, 2015 we're commemorating the Sailing of the 26th New Brunswick Battalion, 100 years to the day they left for the battlefields of Europe on June 13, 1915. On that day 1148 men set sail, comprised of 42 officers and 1106 other ranks, many would not return, and those that did were forever changed. When the battalion returned home at the end of the war, only 4 officers of the original 42 and 113 of the original 1106 other ranks were still with the battalion, the others being killed, wounded or transferred to other battalions. Over all about 6,000 men served with the 26th Battalion over the course of the war. It should be noted that the first member of the battalion to die was Lance Corporal George McKee of Fredericton. He died of pneumonia on April 21, 1915 and was buried in the Fredericton Rural Cemetery with full military honours. He was also the first resident of Fredericton to die on active service. The first member of the battalion to die in action was Private Moses Gallant from PEI. He was killed on September 28, 1915 during the 26th’s first tour in the trenches near Ypres in Belgium. The first officer from the battalion to die in action was Lieutenant Charles M. Lawson, who was a teacher at Saint John High School before the war. On November 26, 1915 he died of his wounds received during a patrol in No Man’s Land. Lieutenant Colonel A.E.G. McKenzie, the commanding officer of the battalion, was killed in action on August 28, 1918. The battalion losses on that day were 57 men killed and 199 wounded. The worst single day of the war for the 26th was September 15, 1916 when they lost 325 all ranks (killed, wounded and missing) helping to capture the village of Courcelette on the Somme. The 26th Battalion never lost a battle the entire war. October 25th 1914 Lt. Col. J.L. McAvity received word to recruit a Battalion for the Expeditionary Force to be known as the 26th. November 1914 Recruiting carried on throughout the Province, Battalion well over strength. December 1914 Battalion Billeted in Armouries, Saint John. June 1915 Training carried on intensively. 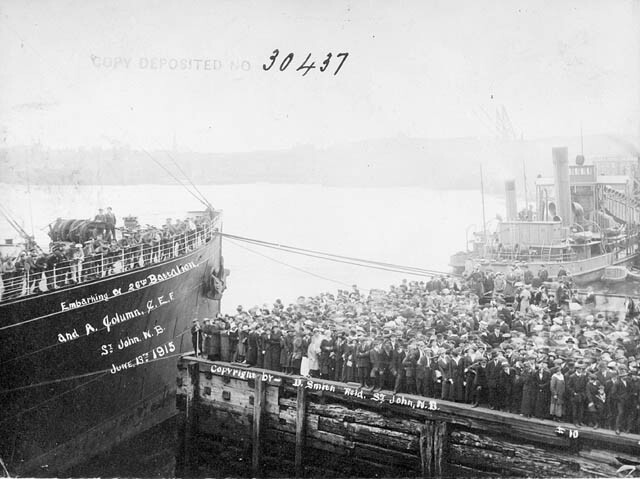 June 13th, 1915 Battalion Sailed from Saint John on Anchor Line Caledonia. June 24th, 1915 Landed at Davenport, England, proceeded by train to East Sandling in the Shorncliffe Area. June to Sept. 13, 1915 Intensive training in England. Sept. 13th, 1915 Advance Party of Battalion left for France including the Transport. Sept. 15th, 1915 Battalion marched to Folkstone and embarked landing at Bolougne, France. Sept. 15 – 18, 1915 Moved toward Firing Line. 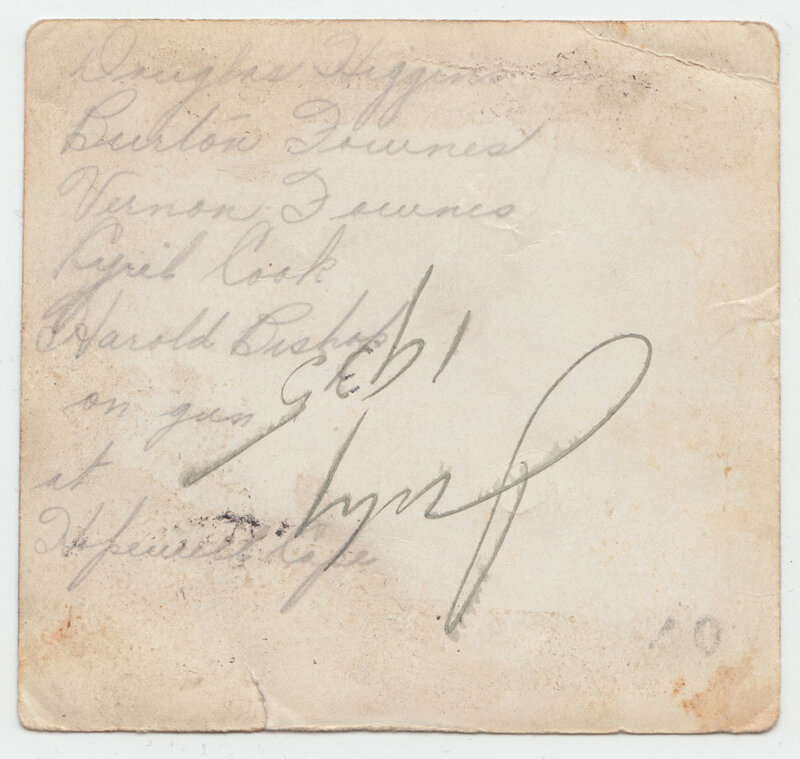 Sept. 25th, 1915 Took over Front, East of Kemmel Vierstraat Road from 22nd Batt. Oct. 13, 1915 Crater Fight Reconnaissance in Force, really one of the first daylight raids, heavy Casualties. Sgt. Ryder received D.C.M., first decoration in 2nd Canadian Division. Oct. 1915 to Mar. 1916 Holding Line. March 1916 Took over St. Eloi Front. April 1916 Lt. Col. J.L. McAvity Invalided to England and command assumed by Lt. Col. A.E.G. MacKenzie. April – May, 1916 Holding St. Eloi Front. May 1916 Raid under Lt. Winter who was later decorated with the M.C. June 3rd, 1916 Heavy German Attack on left of Battalion. June 6 – 12, 1916 Holding Front prior to and after Counter Attack, heavy casualties. June 15 to Aug 15 Back on St. Eloi Front, holding line. Aug. 1916 Out of Line for Reorganization. Sept. 1916 Move to Somme Area. Sept. 15th, 1916 Attack on Courcelette, Battalion went in 555 all ranks and came out 174. Sept. 28th, 1916 Second Tour in Somme, Battalion went in 374 all ranks and came out 78. Oct. 2 to 9, 1916 Rest and reorganization Bertacourt. Oct. 9 to 15, 1916 Move by route march north to Bully Grenay Front. Oct. to Dec. 1916 Holding Line Bully Grenay Front. Jan. 1917 Raid Enemy Lines for Identification Purposes. Jan. 1917 Out of Line to Army Reserve for a month at Bruay. Feb. to Mar. 1917 New Front East of Neuville, St. Vaast. Preperations for Vimy attack. April 9th, 1917 Attack on Vimy Ridge, Battalion in first place. April 14th, 1917 Attack East of Vimy Ridge, Battalion established most forward line on British Front which was named New Brunswick Trench. April to May 1917 Holding Front East of Vimy. June 1917 Army Reserve in Estree Couche. July 1st, 1917 Took over New Front East of Lievan towards Lens. July 1917 Lt. Col. MacKenzie, D.S.O. goes on course to England and command assumed by Lt. Col. W.R. Brown, D.S.O. Aug. 15th, 1917 Attack from St. Pierre towards Lens, very heavy casualties. Aug. 20 – Sept. 8 Rest and Refit Maison Bouche. Sept. – Oct. 1917 Holding Front East of Vimy. Oct. 1917 Lt. Col. MacKenzie returns and takes command of Battalion, Col. Brown goes to England to command the reserve. Nov. 1917 Move North to Ypres Salient. Nov. 6th, 1917 Attack and Capture of Passchendaele. Nov. 1917 Move back to Vimy Front. Dec. 1917 Lt. Col. MacKenzie, D.S.O. Invalided to England. Maj. C.G. Porter, D.S.O. assumes command. Dec. 21st, 1917 Battalion moves to Army Reserve, first Xmas out of Line. Jan. 1918 Take over Front East of Vimy. 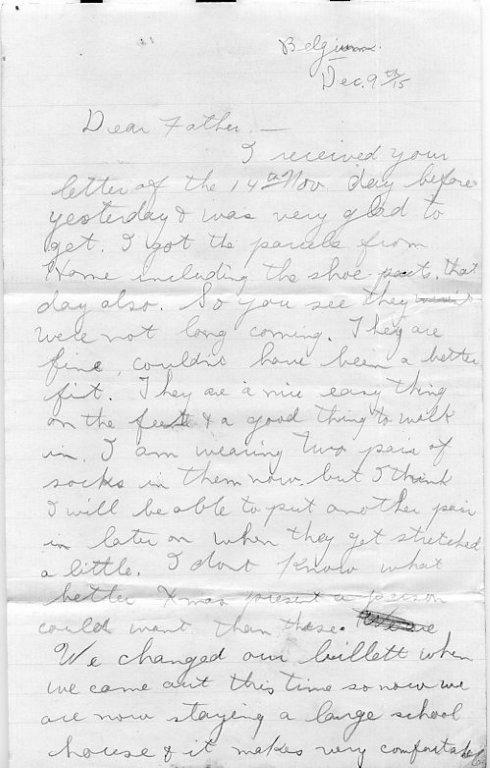 Feb. 1918 Move back to Lens Front. March 1918 Battalion out for rest and refit, cut short by German Attack South on the 21st. Mar. 24, 1918 Move South to Bienvilliers Aubois. Mar. 26th, 1918 Move North again, S.E. of Arras, take over Telegraph Hill Switch. 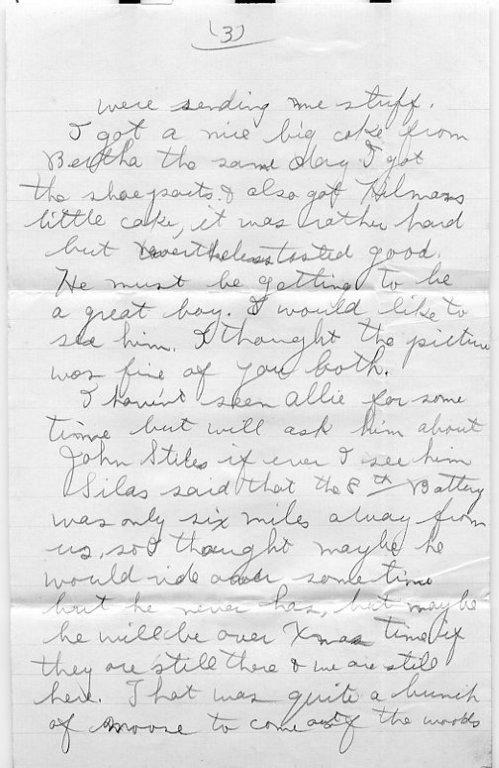 April 7th, 1918 Lt. Col. A.E.G. MacKenzie, D.S.O. returns to Battalion, Col. Porter assumes duties of 2 I/C. Apr. – July 1918 Holding Front East of Neuville Vitasse, many raids carried out by the Battalion. July 1918 Hauteville for rest and refit. Aug. 1918 Moves to Amiens. Aug. 8th, 1918 Attack East of Amiens, great depths gained, many prisoners taken. Aug. 18th, 1918 Moved North to Arras Area. Aug. 26th, 1918 Attack East of Arras beginning of the end. Aug. 28th, 1918 Lt. Col. MacKenzie Killed, leading attack. Sept., Oct. to Nov. 11th, 1918 Continue attacks towards Cambrai Valenciennes, with Battalion at Wancourt when Armistice Declared. Nov. 15th, 1918 Detail from Battalion in Official Entry into Mons. Nov. 20th, 1918 Start March to Germany with Army of Occupation. Dec. 3rd, 1918 Cross Rhine at Bonn Dursen, Inspected by Gen. Currie at the Bridge. Jan. 1919 Germany East of Bonn, move back to Tamines in Belgium. Mar., April 1919 Tamines moved back to England. May 10th, 1919 Sailed from England on Olympic. May 17th, 1919 Landed in Halifax, Moved by train to Saint John, great reception. May 17th, 19th, 1919 Demobilization. This Saturday, we are honouring the men of the 26th Battalion with a Colour Parade, on June 12, 1915 in front of cheering crowds in excess of 20,000 people, the 26th Battalion marched from the Armoury in Saint John to the Harbour. In the early morning hours on June 13, 1915, the 26th Battalion boarded the troop ship, “Caledonia” and sailed for England. In commemoration of this historic event, the Royal New Brunswick Regiment will parade in full dress uniforms, along with the RCMP Pipes and Drums Band and local cadet groups (the 560 Moncton Army Cadets). The parade will be inspected by Brigadier General Peter Atkinson (retired). BGen. Atkinson served with the Canadian Forces for over 35 years, and still has strong ties to Albert County. This parade has special meaning for the Royal New Brunswick Regiment for they are the living embodiment of the 26th Battalion and hold their battle honours, which are extensive. Come out and help us remember the Fighting 26th! To View the Event Click Here.